Genetic differentiation of scattered populations at neutral loci is characterized by genetic drift counteracted by the remaining gene flow. Populations of Pinus cembra in the Carpathian Mountains are isolated and restricted to island-like stands at high-elevation mountain ranges. In contrast, paleobotanical data suggest an extended early Holocene distribution of P. cembra in the Carpathians and its surrounding areas, which has contracted to the currently disjunct occurrences. We analyzed the genetic variation of 11 Carpathian populations of P. cembra at chloroplast and, in part newly developed, nuclear microsatellites. Both marker types revealed low levels of genetic differentiation and a lack of isolation by distance, reflecting the post-glacial retraction of the species to its current distribution. Stronger effects of genetic drift were implied by the higher genetic differentiation found for haploid chloroplast than for diploid nuclear markers. Moreover, we found no association between the values of population genetic differentiation for the two marker types. Several populations indicated recent genetic bottlenecks and inbreeding as a consequence of decline in population sizes. Moreover, we found individuals in two populations from the Rodnei Mountains that strikingly differed in assignment probabilities from the remaining specimens, suggesting that they had been introduced from a provenance outside the studied populations. Comparison with Eastern Alpine P. cembra and individuals of the closely related Pinus sibirica suggests that these individuals presumably are P. sibirica. Our study highlights the importance of the maintenance of sufficiently large local population sizes for conservation due to low connectivity between local occurrences. The online version of this article (doi: 10.1007/s11295-014-0770-9) contains supplementary material, which is available to authorized users. We acknowledge the CRUS-Sciex grant (12.071) that allowed the stay of BL at WSL. 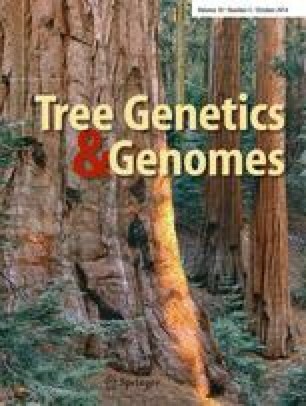 Sequence data of nuclear microsatellite loci are retrievable from NCBI GenBank; cp/nSSR data are uploaded on the TreeGenes database.